The top portion of a paper MOLST form. 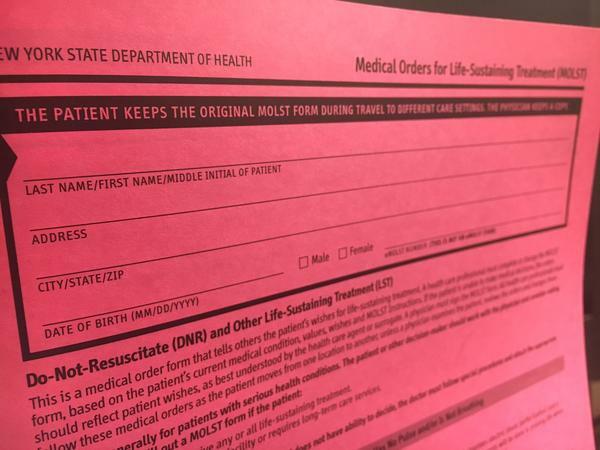 It says, “The patient keeps the original MOLST form during travel to different care settings. The Physician keeps a copy,” on all four pages. Rodgers, 82, says he and his physician filled out the form together when he moved to a community outside of Rochester, N.Y.
For years physicians in New York state have asked seriously sick patients to fill out this paper document, capturing their wishes in case of emergency. 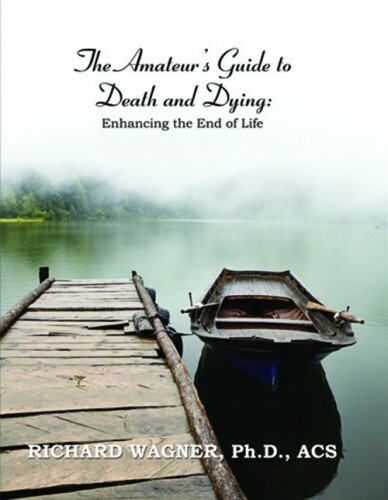 Most Americans don’t plan ahead for end of life. But for those who do, like Rodgers, there’s a risk that the right people won’t even see the document when it really matters. After all, a piece of paper is easily lost or left behind in an emergency. Advocates and lawmakers in New York are now pushing to shift the paper system to a mandatory electronic database for better access. But the requirement would call for a technology fix that’s not coming easily. Most states have some version of these documents, typically called a Physician Order for Life Sustaining Treatment, or POLST. In New York state, the form is called MOLST. It stands for Medical Order for Life Sustaining Treatment. Unlike advance directives, the MOLST form is a detailed legal document, prepared with a physician. MOLST forms are not meant for the general population. They’re meant for patients who physicians suspect may die within a year. Without a POLST-like form, physicians or paramedics are trained to keep someone alive including aggressive life-sustaining treatment, if need be. Nearly everyone benefits if patients make their medical wishes clear. Patients make sure they’re not subjected to measures they don’t want. Family members don’t have to wonder. And insurance companies can save money. 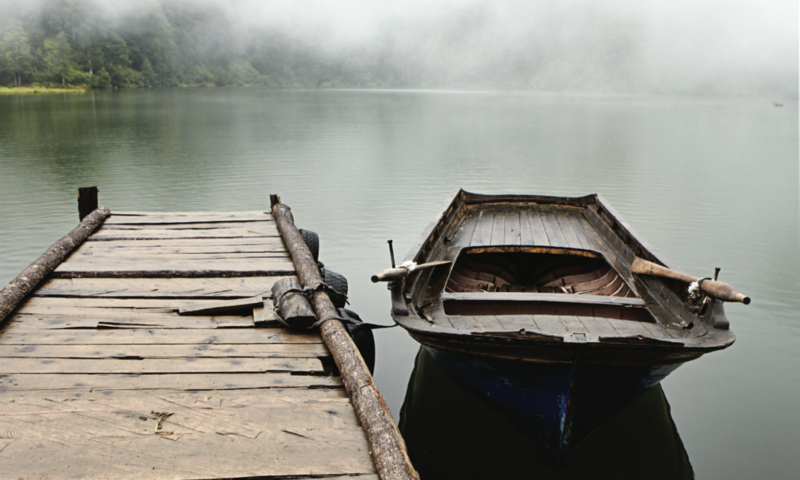 End of life care is one of the biggest medical expenses in our health system. About a quarter of traditional Medicare costs are for expenses patients incur in their last year of life, according to a report from the Kaiser Family Foundation. “The majority of states right now have a POLST process. The question is how effective is that process if I can’t get access to that as a health care provider?” asks Rick Bassett, chair of the national POLST technology committee. A handful of states have established electronic databases for these forms — eMOLST is New York state’s version. Lawmakers are considering a bill that would require doctors to submit an electronic version when they fill out a hardcopy within 14 days. In theory, this would ensure access to the form no matter which clinic or hospital a patient may end up in during an emergency, explains Patricia Bomba, vice president and medical director of geriatrics at Excellus BlueCross BlueShield and director of the MOLST program. “It just is the better way to do it,” she says. Excellus currently funds the MOLST and eMOLST systems, 100 percent. But even the electronic solution has its own problems to work out. “Even if you fill out one of these forms — having it actually pop out in front of the right person at the right time has been a really big challenge,” says Kirsten Ostherr, a Rice University professor focusing on health and medical digital media. There are major access issues, Ostherr says, in general, when it comes to electronic medical records. For one, different hospital electronic record systems don’t link to each other or to the E-MOLST database, which is separate. And outside providers, like paramedics don’t usually have access to these systems. The current eMOLST system is just not accessible for busy doctors, explains Daniel Mendelson, director of palliative care and associate chief of medicine at Highland Hospital in Rochester. “Expecting a medical provider to look in their own record is reasonable. Asking them to look at an outside record and multiple outside records is probably not going to happen,” he says. Mendelson was on the original team that developed the paper MOLST form in New York. He’s a self-described “power user” and embraces technology. But he doesn’t use eMOLST because it doesn’t directly connect to the system his own hospital uses for patient information. For his own father, he trusts the paper form more than the eMOLST system. “It’s not that people are not hardworking and well meaning, but how many tasks can you load somebody with in an emergency?” Mendelson asks. At least two hospitals in New York state have successfully developed a direct connection between an electronic health records system and eMOLST. The in-house information technology team at NYU took a few months to work on the connection, start to finish, according to Christine Wilkins, advance care planning program manager at NYU’s Langone Medical Center. Providers can use one password to sign on and view medical records and a patient’s eMOLST. Wilkins says they hope the easier to use technology will help doctors start using eMOLST more. And that will ultimately benefit patients. “It’s about having a more robust conversation, but then, it’s having a much better way to document what their wishes are. And for that documentation to be seen across the board,” Wilkins says. Another hospital, Orange Regional Medical Center, in Middletown, N.Y. also established single sign on for its providers earlier this month. Currently, the eMOLST system has roughly 10,000 patient files, according to Katie Orem, eMOLST administrator at Excellus BlueCross BlueShield. That’s about 10 percent of New York state residents who die from chronic disease every year, she says. If the bill passes, New York would have a statewide database.